SPA can usually run entirely in the browser with no internet connection after it has initially loaded as they can cache any local storage effectively. An application sends only one request, store all data, then it can use this data and works offline. After the application loads, there will be a few communication between the server and the client agent with small amounts of data are sent back and forth instead of full pages. In addition to less bandwidth, this also means less load on the browser and server. the server will consume less resources because the backend developer can focus on providing an efficient API instead of building the layouts server-side. It is slow to download because heavy client frameworks are required to be loaded to the client. Analytics tools such as Google Analytics rely heavily upon entire new pages loading in the browser, initiated by a new page load. SPAs do not work this way. After the first page load, all subsequent page and content changes are handled internally by the application, which should simply call a function to update the analytics package. Failing to call said function, the browser never triggers a new page load, nothing gets added to the browser history, and the analytics package has no idea who is doing what on the site. It is possible to add page load events to an SPA using the HTML5 history API; this will help integrate analytics. Every change eg. display the data or submit data back to server requests rendering a new page from the server in the browser. These applications are large, bigger than SPAs due to the amount of content. It’s easy for proper SEO management. It gives better chances to rank for different keywords since an application can be optimized for one keyword per page. Frontend and backend development are tightly coupled. The development becomes quite complex. The developer needs to use frameworks for either client and server side. What should i choose ..? If you know you need multiple categories (because, for instance, you run an online shop or publish a lot of other content) — use a multi-page site. If you are sure that your site is appropriate for a pure single-page experience — go for it. if you can just barely fit everything into a single page, consider the hybrid site instead. This is another way . A hybrid application takes what is the best in both approaches and try to minimize the disadvantages. WebSockets are a bidirectional stateful real-time client-server communication technology part of the HTML5 specification. WebSockets are typically used in applications where real time updates are required. That can easily implement an ‘AJAX library on top of WebSockets and still use the same WebSocket connection for bi-directional real-time data transfer. it’s built and based on Typescript. In other words, you have to embrace this language to use Angular v2 and up. It might be a hard decision to make for some but it might be worth it. The use of Typescript introduce type-correctness and lot of modern ES features. 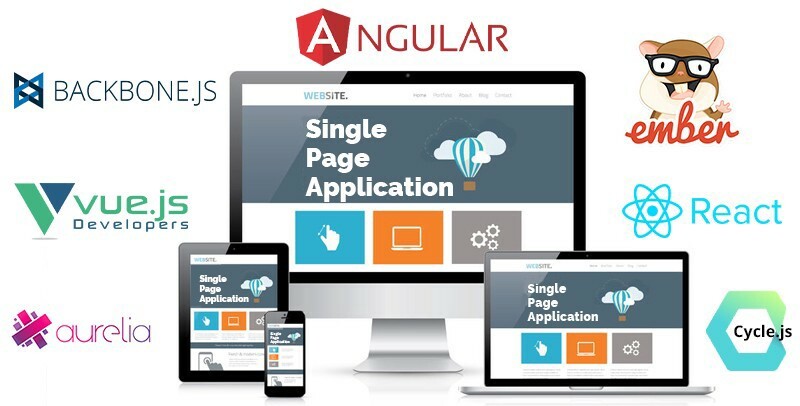 Angular uses well-known to us concept of components, virtual DOM and templates. Code for templates can also be placed in a separate HTML template file. What’s new in Angular is a concept of modules and services. Modules allow breaking your web app into smaller chunks that can work separately. It’s also based on virtual DOM but it’s implementation vastly differences from React’s. It’s known for being optimized in a slightly different manner. Its optimized for efficiency, meaning that it only updates these DOM elements that truly need that. In place of JSX Vue places its templates. These feature easy-to-use and readable syntax for creating your UI. Vue is often considered easier to learn, so much so that it’s really recommended for smaller teams needed to get the job done right and fast. Since you get rid of the default browser navigation, URLs must be managed manually.